A Manhattan community board panel has backed a city plan for protected bike lanes on 52nd and 55th streets. The CB5 transportation committee supported the proposal on Monday night after Department of Transportation officials formally presented its plan [PDF] for paired east-west lanes similar to those on 26th and 29th street, which have proven popular for cyclists. It is likely that the full board will back the proposal as well. 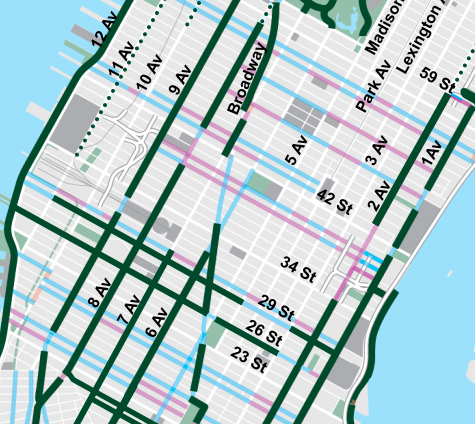 The route would become an integral part of bike network, linking Manhattan’s four major north-south protected lanes. The CB5 committee vote follows a similar vote by neighboring CB6 earlier this month, also in favor of the lanes. According to DOT, almost 1,000 cyclists use 55th Street now as a crosstown route every 12 hours, so agency officials argued that the protected lane was needed simply to keep up with demand. The agency also spoke of a gender imperative, as women cyclists are far more likely to choose that form of transportation if a roadway has a protected bike lane. The agency also touted the overall safety record of roadways with such protection for cyclists: 15-percent drop in crashes with injuries, plus a 21-percent drop in pedestrian injuries. Nonetheless, some members of the committee called for stepped-up enforcement of cyclists. The vote comes as many other community boards fight DOT street safety efforts. Community Board 9 in West Harlem, for instance, has opposed a safety redesign of Amsterdam Avenue for two years. The board is holding a press conference today amid outrage after a pedestrian was killed on the still-unsafe strip on Friday night. More NIMBY heads exploding, as per their fixed destiny. The 1969 Plan, the last comprehensive plan NYC ever did, called for a crosstown transportation system of some type across 50th Street so people could travel quickly crosstown. Every neighborhood has at least a few bike-hating NIMBYs, and a couple tend to sit on their community boards as well. No one seems it relevant to mention that there are strong bike advocates on these committees as well. And while the audiences at CB meetings may attract naysayers, I would hope that public comments are attributed to public attendees and not to the board. I have seen variations of this error at other publications, though not often here. It would have been interesting to see the vote count for this measure – the CB5 office certainly would file that with the resolution, which now has to go before the full board (but is unlikely to be derailed there). It appears that Gersh had an abreaction to writing six paragraphs about a positive development brought about in part by a thoughtful community board; he just had to add that last bit about Manhattan Community Board 9.